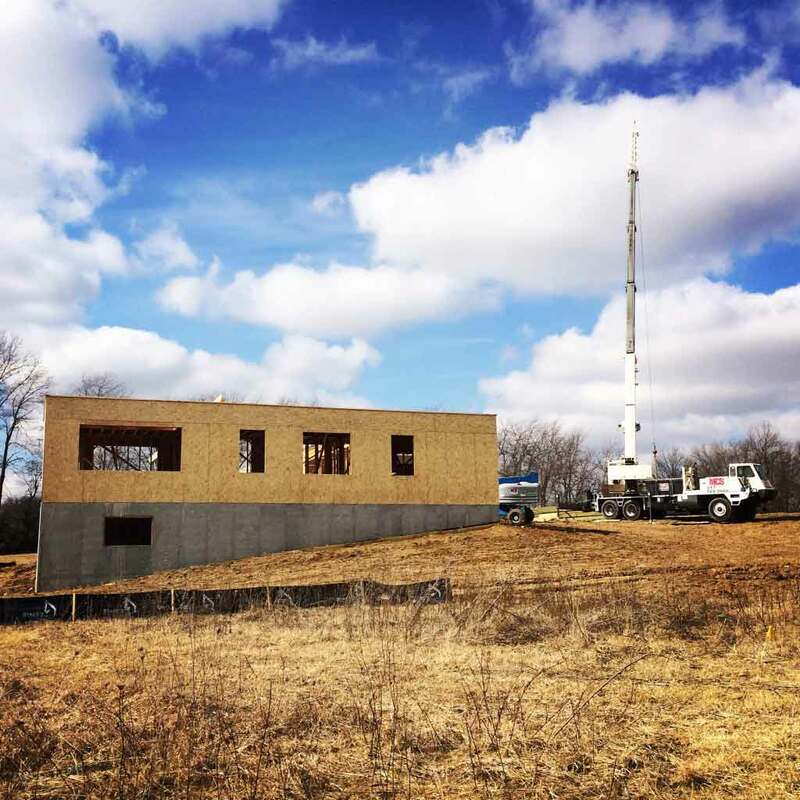 New Modern House 1 located in Zionsville, IN broke ground in fall 2015 for family of four seeking an energy efficient, modest, modern dwelling responding emphatically to its site #Copperwood. 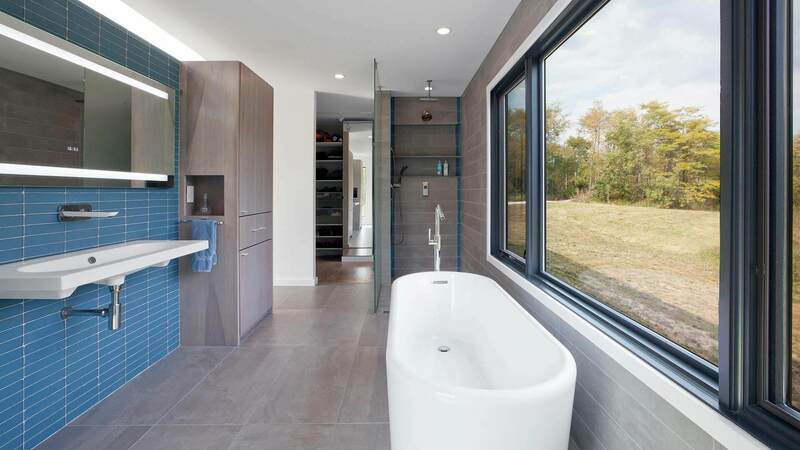 This design, located on a 20 acre lot with natural habitat and wetlands, features open concept planning with distinct components for Living, Bedrooms, and Garage. 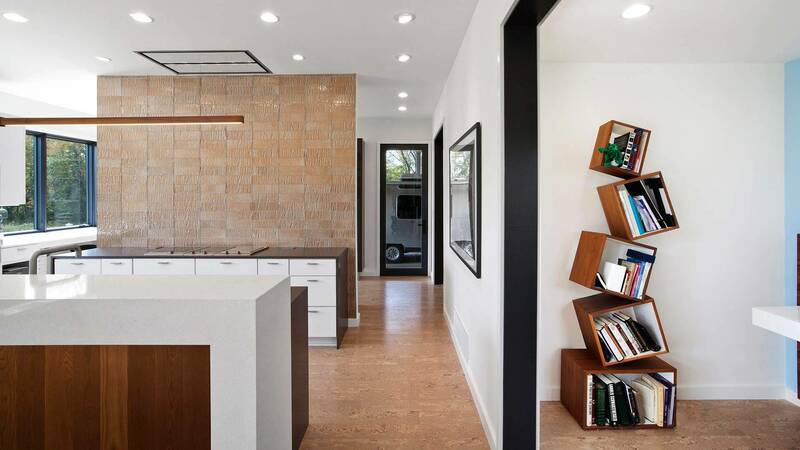 Major design element includes a dramatic wing roof overhanging primary indoor living spaces and Airstream port, with Airstream functioning as Home Office + Guest Suite while docked. 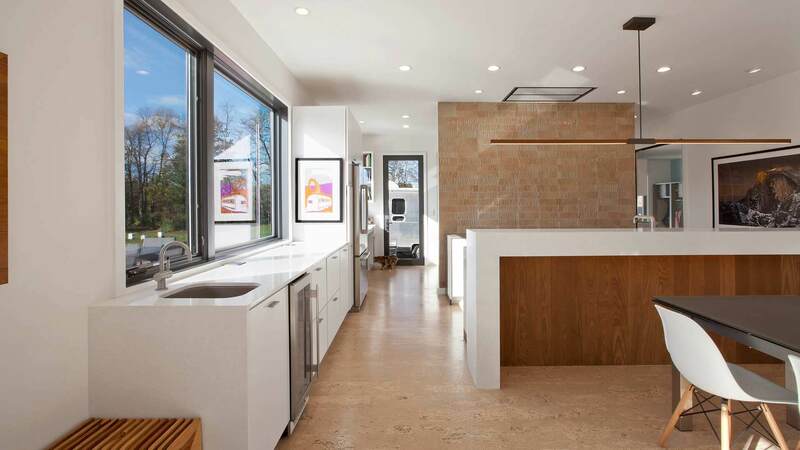 In addition, kitchen space features front and back areas with pass-through to serve outdoor entertaining. 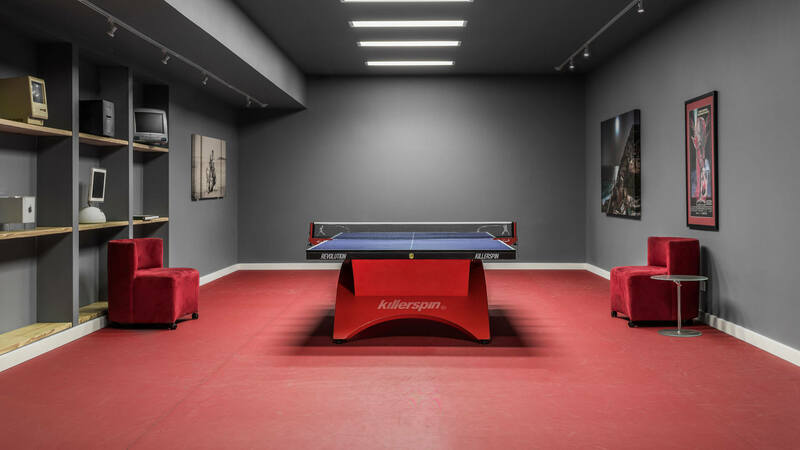 And lower level features architectural stair, north bay light, and regulation table tennis area for nationally-rated Owner. 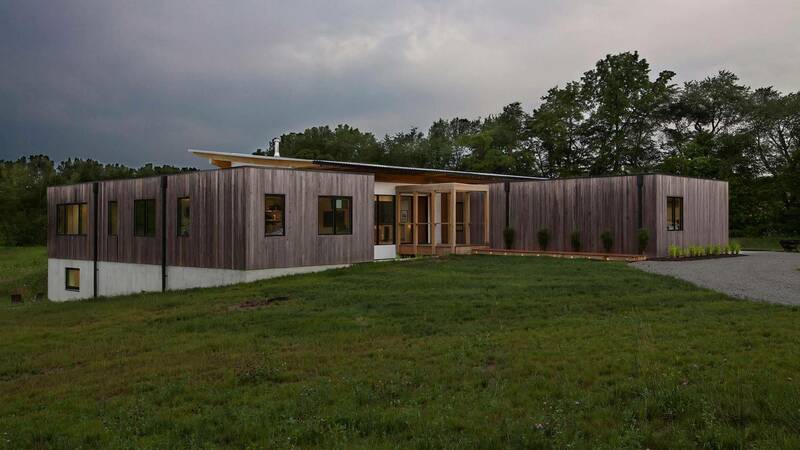 Mostly low-tech passive and active green-building strategies were implemented throughout, with the home achieving a HERS Performance Rating of 43, which is 60% better than a standard new energy-code-compliant home. 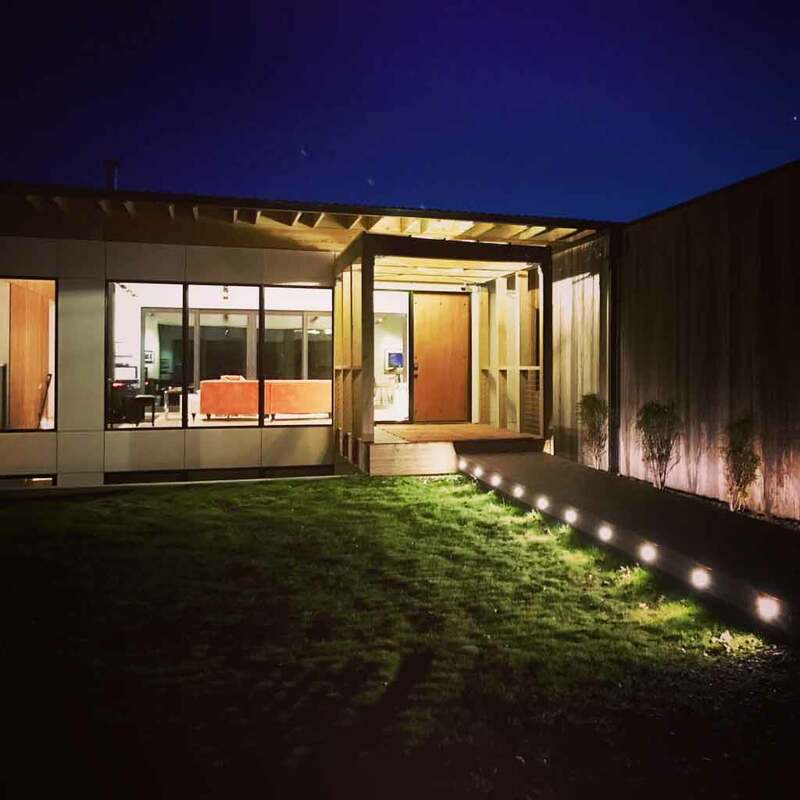 Smart Home Technology is used to control lighting, HVAC, and security from the Owner’s mobile devices. We completed this project in late September 2016 – please check-back as we will be posting periodic updates and Owner feedback. 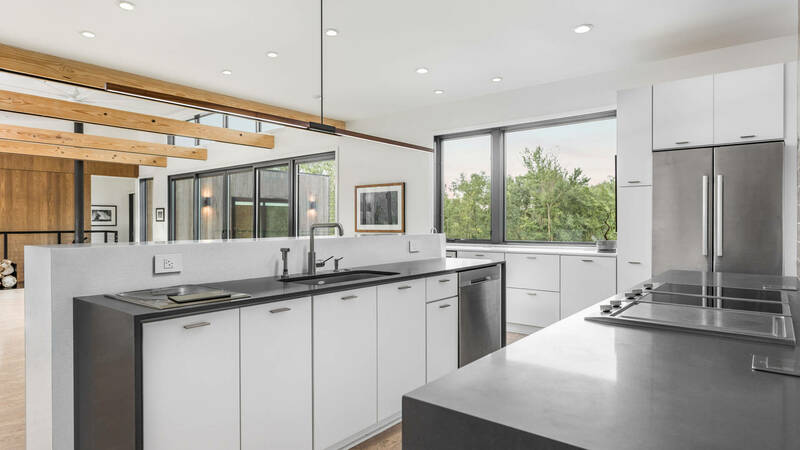 The AIA Home Tour Committee selected Copperwood to be on the AIA Home Tour on September 16-17, 2017. We enjoyed seeing so many of our friends, colleagues, clients on the tour! Here below are some media links featuring Copperwood. 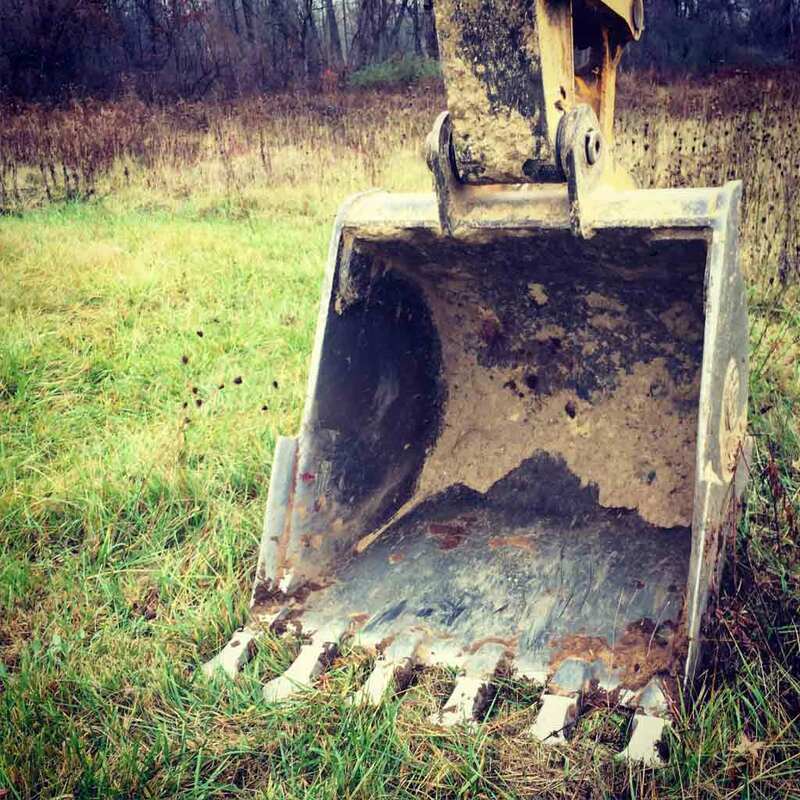 No special ceremonies – let’s get digging. Actual site grading varied from available GIS maps, but we were able to make the desired adjustments to coordinate with adjacent wetlands and grades. 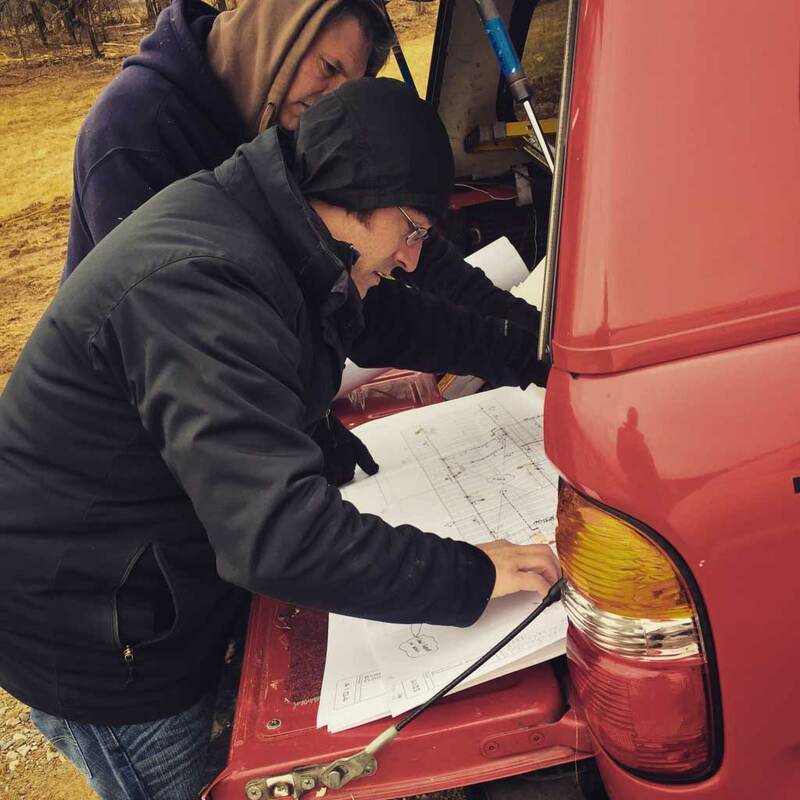 During excavation, we were able to clarify and work-through the issues related to existing grading. We ended-up realizing some savings by making the right design decisions on the fly. It’s critical that the architect is involved in every phase of the construction to make the right decisions consistent with DESIGN INTENT. 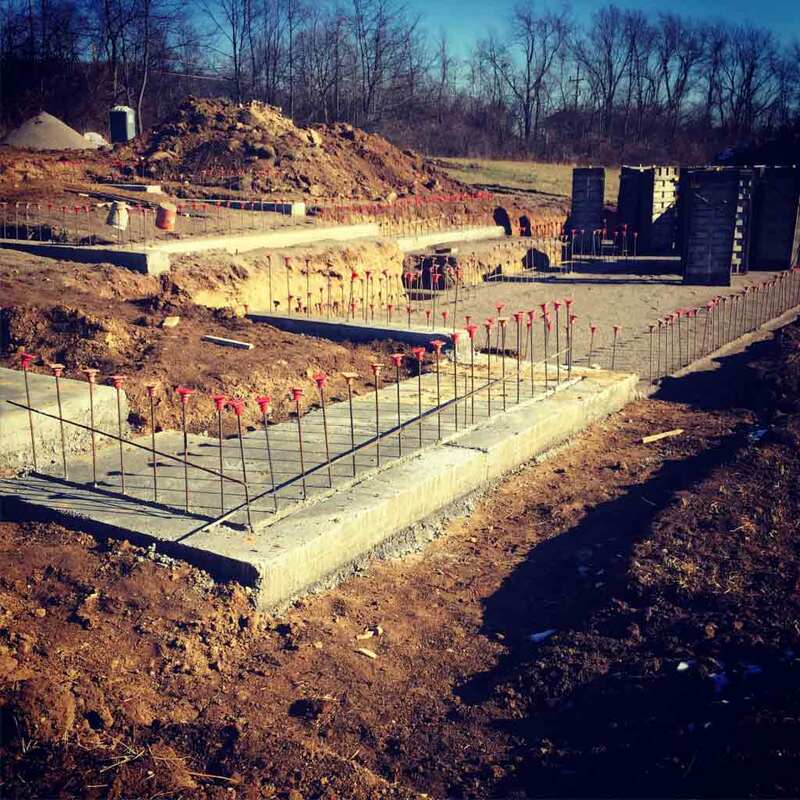 Despite some delays, we were able to install and backfill footings prior to freezing weather. The large footings in the foreground are for the Airstream canopy area retaining walls. 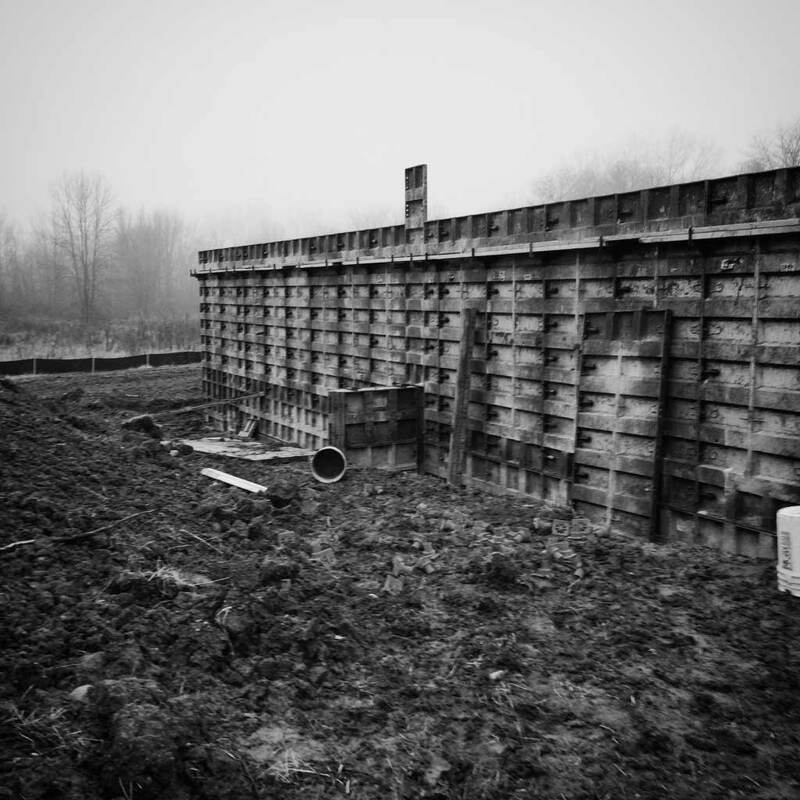 Initially we had a number of retaining walls on the project, but reduced a few to save on costs. Negotiating the site grades was an interesting process, but we were happy to have saved some effort and cost with some of the decisions. 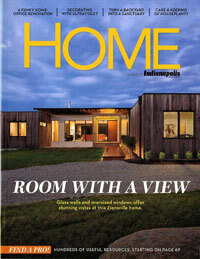 It’s interesting how the residential market differs from the commercial market regarding design and construction. It seems the structural engineers and residential trades are often at odds. 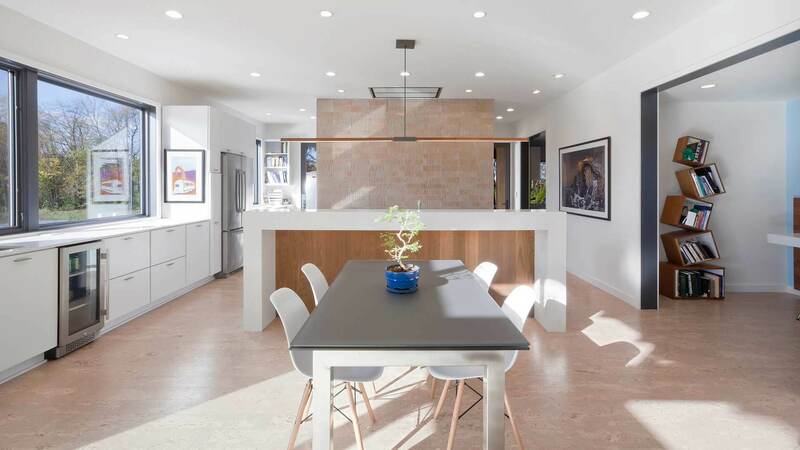 Having come from a commercial architecture background, and now working predominantly in the residential marketplace – the differences are very evident. 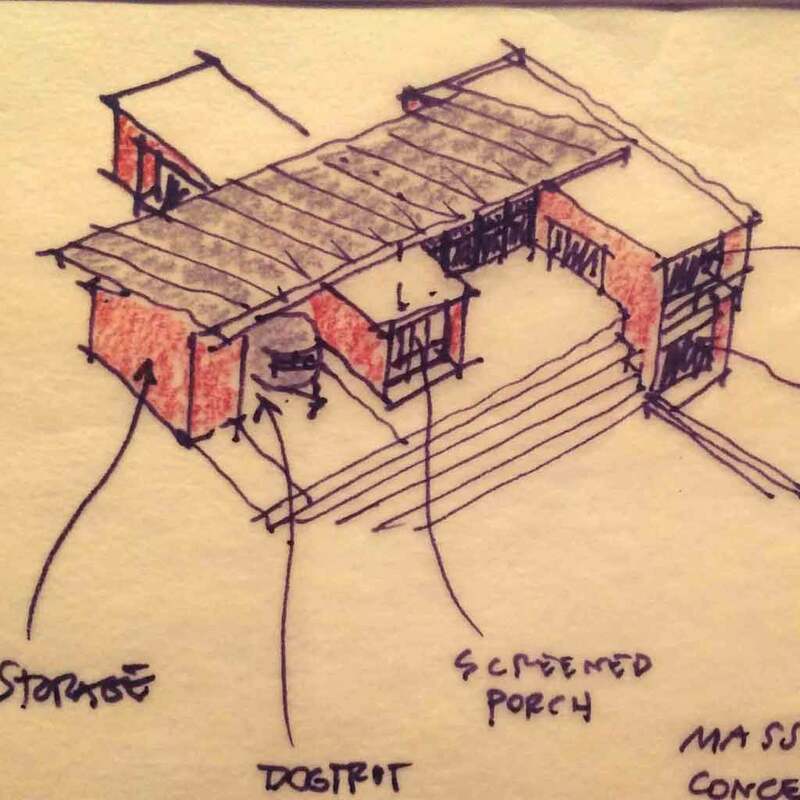 Whenever we have a structural engineer collaborate on our unique projects, the concrete trades in particular often have differing opinions on best techniques. It’s interesting to learn the different opinions – many related to costs. Some like to comment about “over-design”. Would we rather the structural engineer “under-design”? I don’t think so. 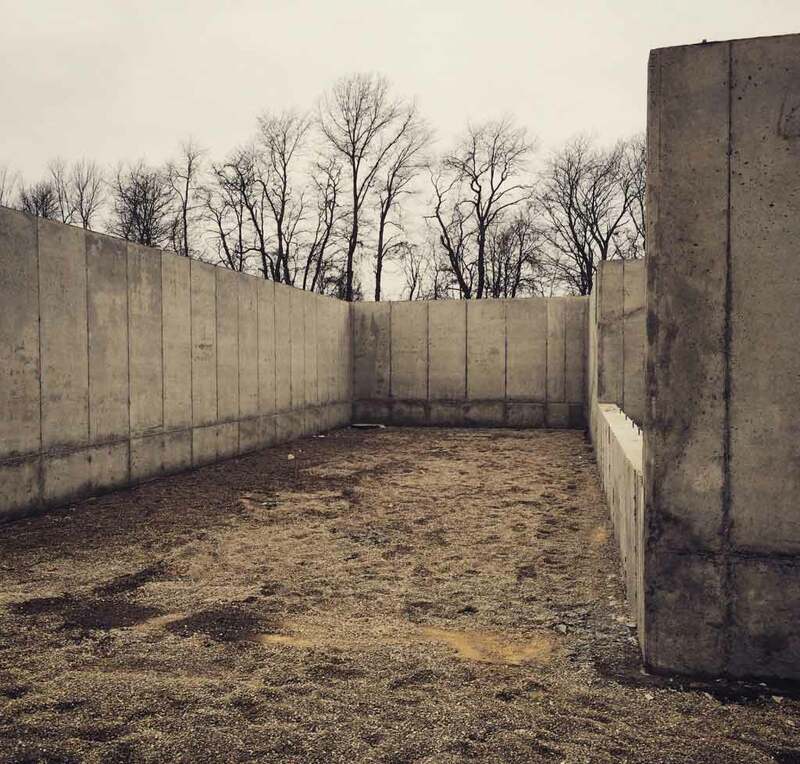 In the case below, the concrete contractor wanted to add a few counterfort walls to reinforce the long foundation wall. 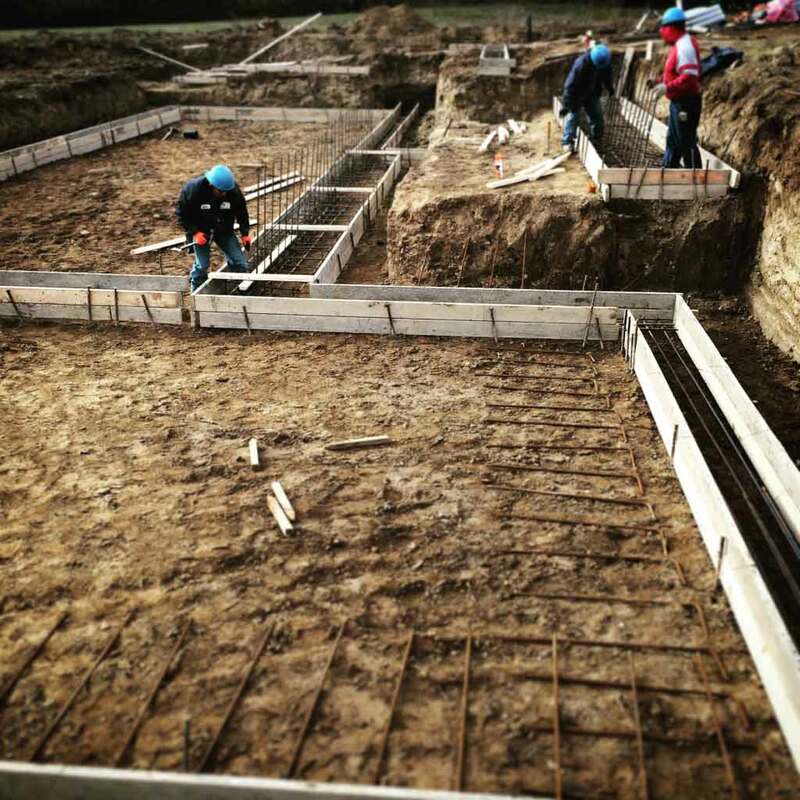 One reason was to support the length during backfilling operations if we decided to backfill prior to floor structure completion. 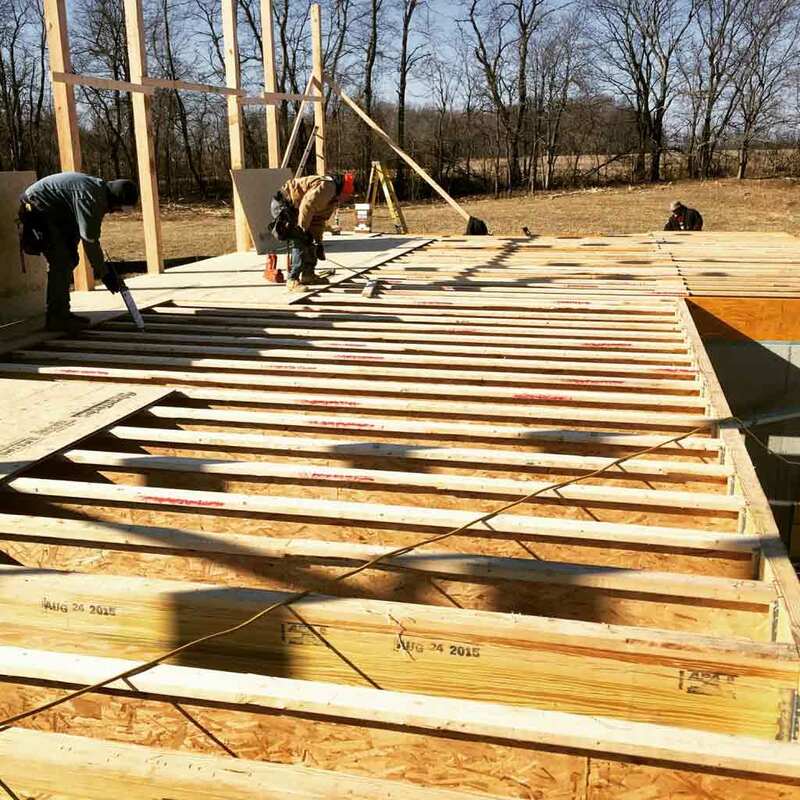 Once we install floor structure, we achieve adequate lateral support without the counterfort walls. Some opined that we could have done with less rebar reinforcement. Sure could have, but we stuck with the structural engineer recommendations. 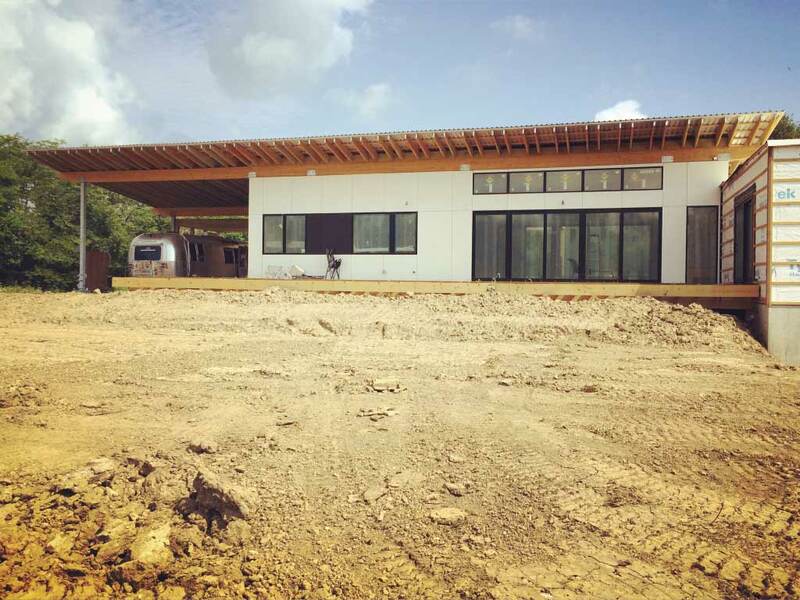 We considered various methods of project delivery, construction techniques, and client priorities relative to project costs. 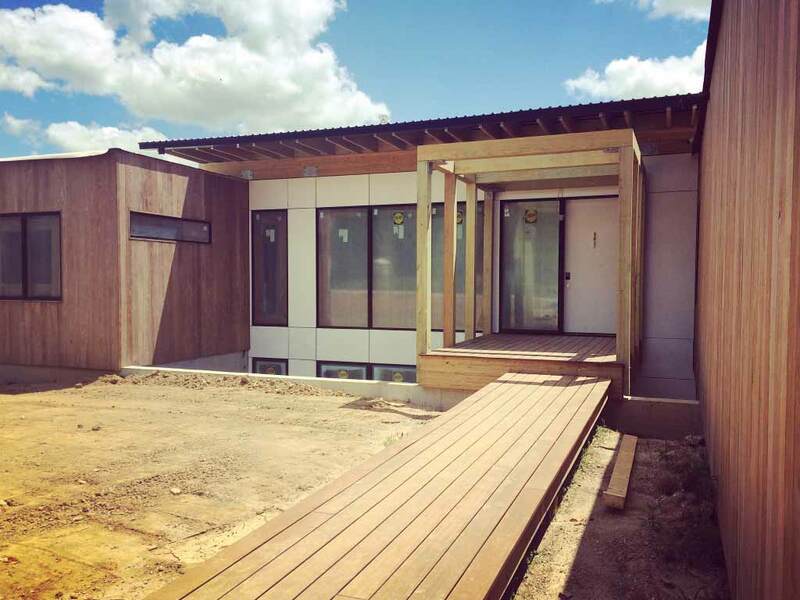 To be sure, we and our client do respect the advantages of a prefab process (controlled environment, fast site erection), but we chose instead to stick-build. 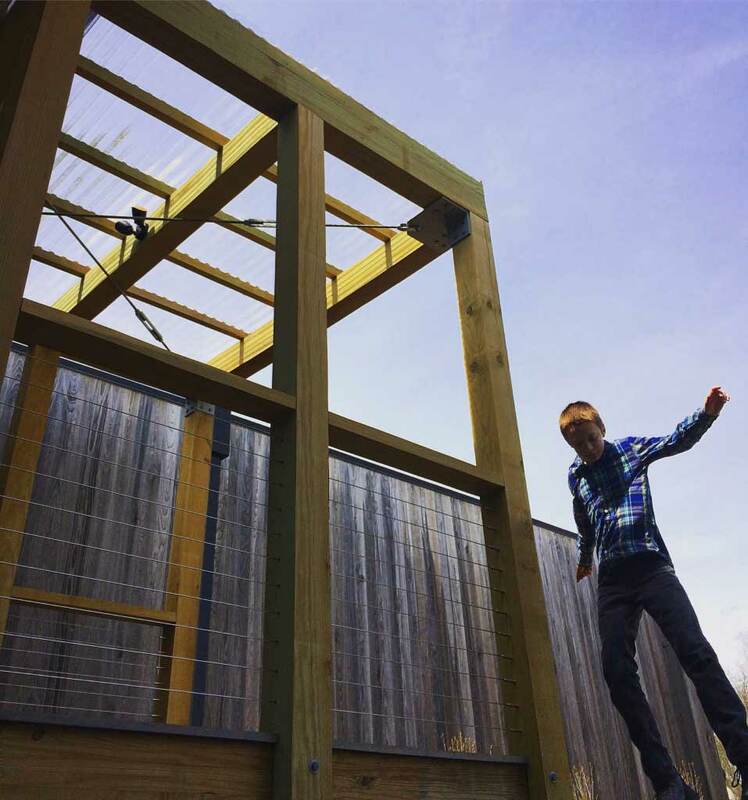 All things considered, we felt this method was going to be the most cost-effective and logical based on the overall design (open-concept bay widths, heavy timber, large Airstream canopy). 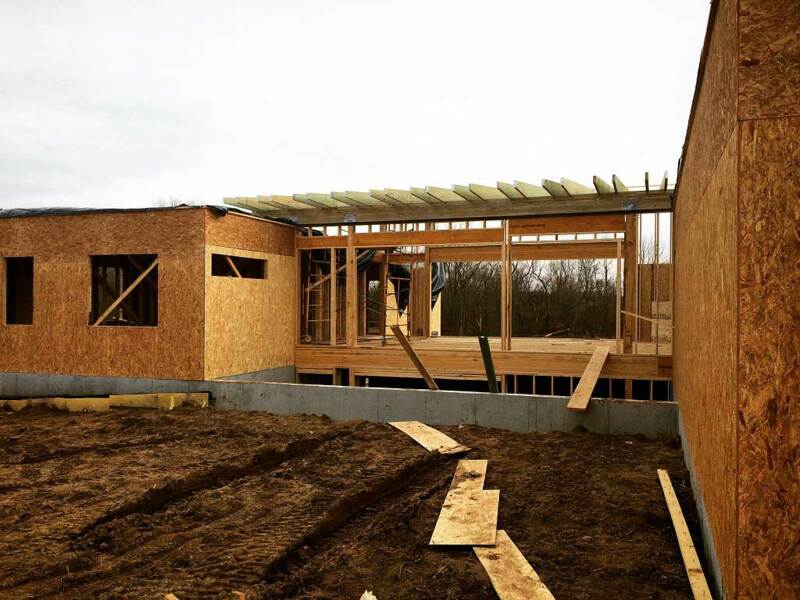 However, even though were ready to frame by late December, we had some delays with weather and framer availability. 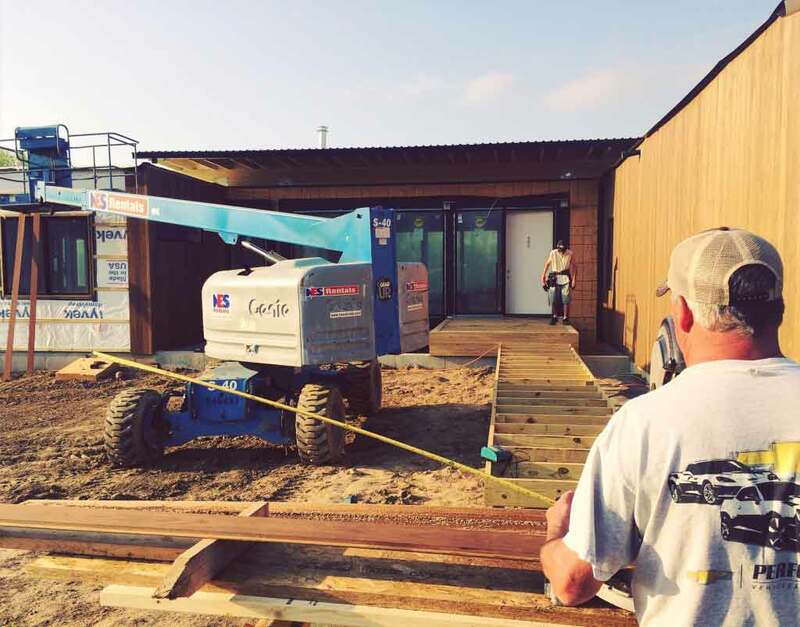 So ultimately, we ended-up starting actual site framing work in early February 2016. 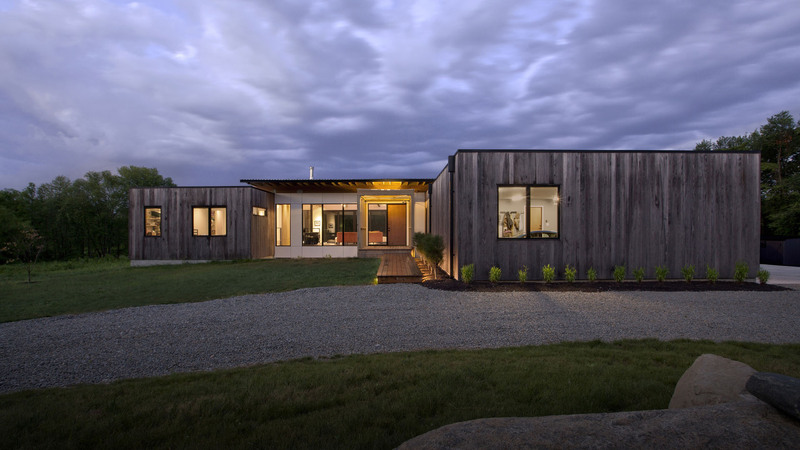 So looking-back, maybe prefab would have benefited the process – if feasible with our design. 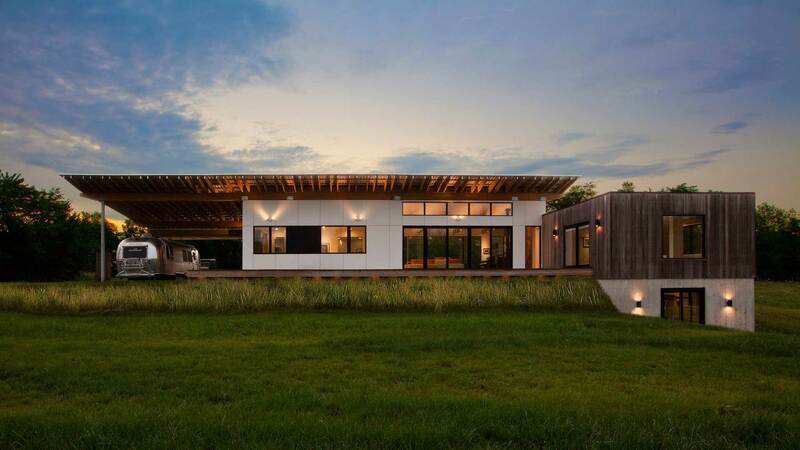 The trick is, we didn’t design it from the beginning with prefab in-mind, which is important in making that technique feasible. 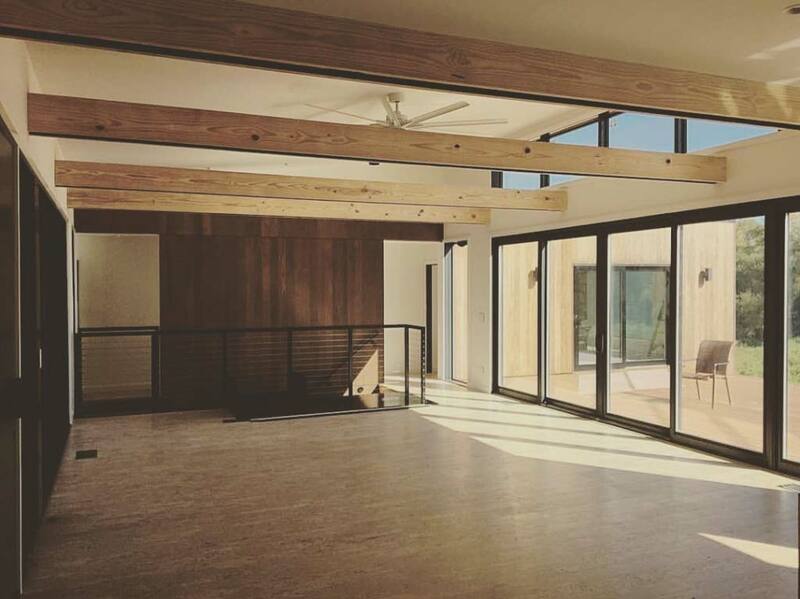 We didn’t anticipate having to source the heavy timber for the project via out-of-state suppliers, but the local lumber yards said they didn’t have access to what we needed. Happily, we were able to find what we needed from American Pole and Timber out of Texas. 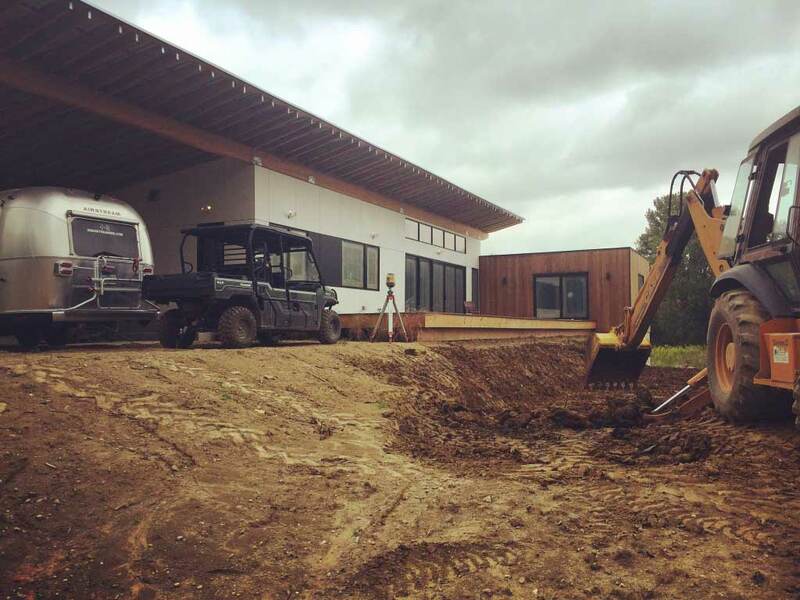 We can’t say it was the greenest way to source the material – I guess if we were doing this project in the Pacific Northwest, we would not have had a problem. Part of the challenge is that we needed treated wood for all exposed wood. 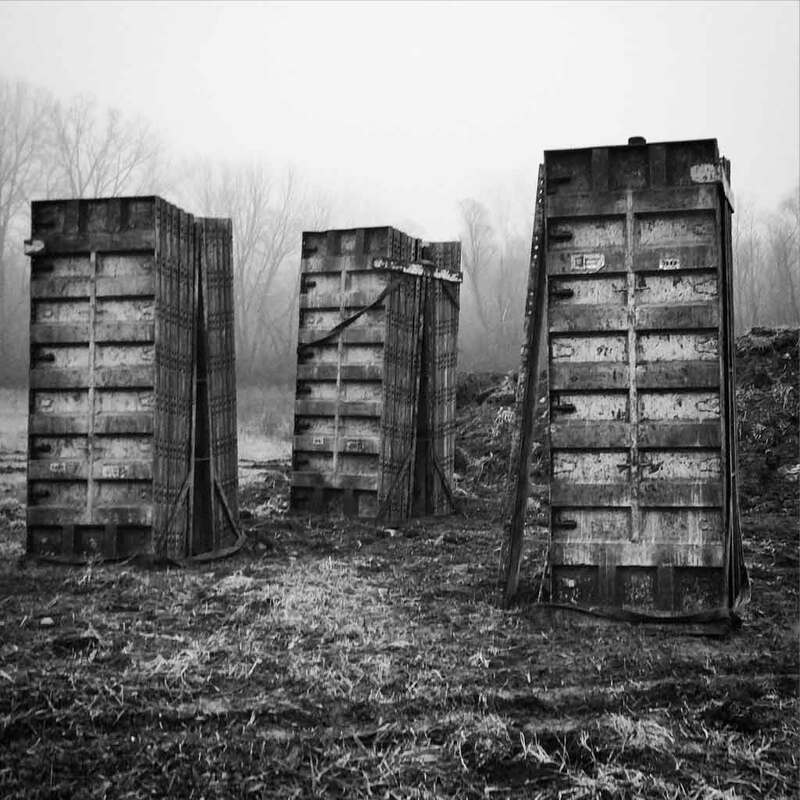 We needed 32′ long 2x12s treated, which was not readily available in that length. 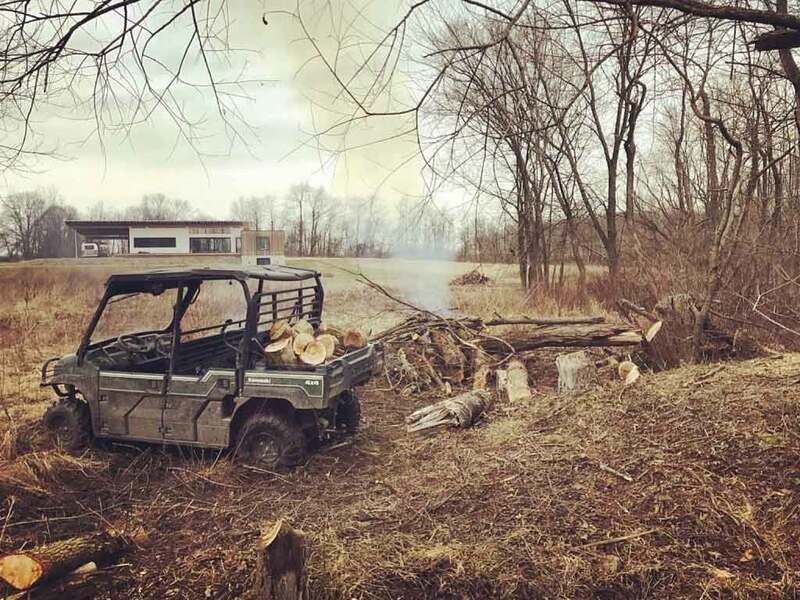 Texas cut that material for us out of logs, and since their other 6×6 timbers were a better bargain than local suppliers, we decided to load-up the truck with some additional lumber to cover some of our other needs. 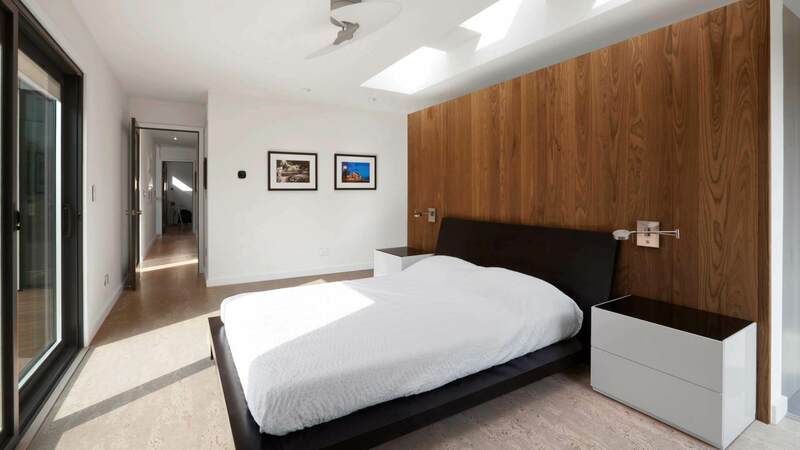 We strategically placed a few skylights into the bedroom wing roof to maximize natural light in the right places – this particular opening is a 3-skylight-wide slot in the Master Bedroom ceiling primarily over the master bed headwall, which floats short of the ceiling and separates bedroom from bathroom. 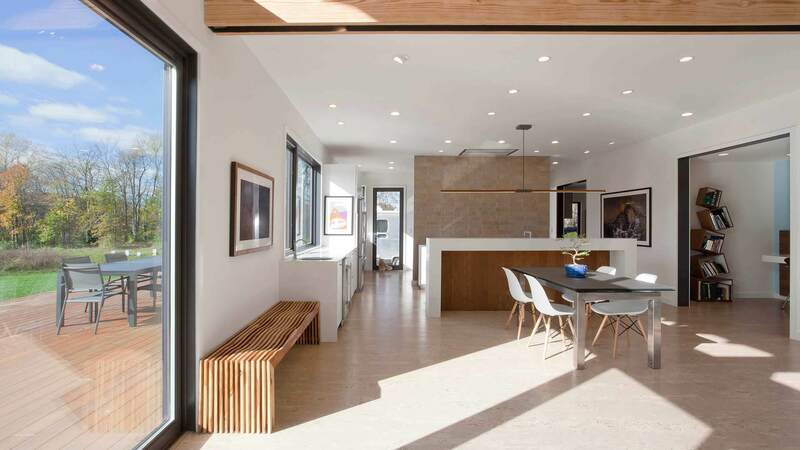 Most of the skylights are fixed, but a couple are motorized to allow stack-effect ventilation. 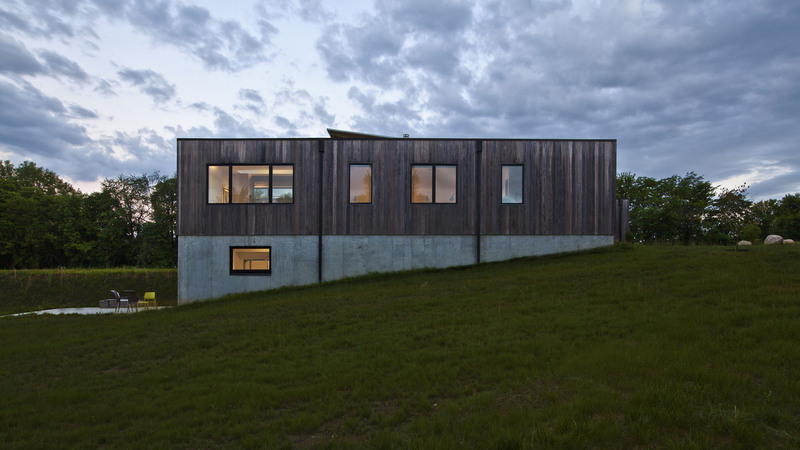 Light and panoramic views achieve a dramatic engagement with the site. Stay tuned for finish photos of these spaces in a few months. 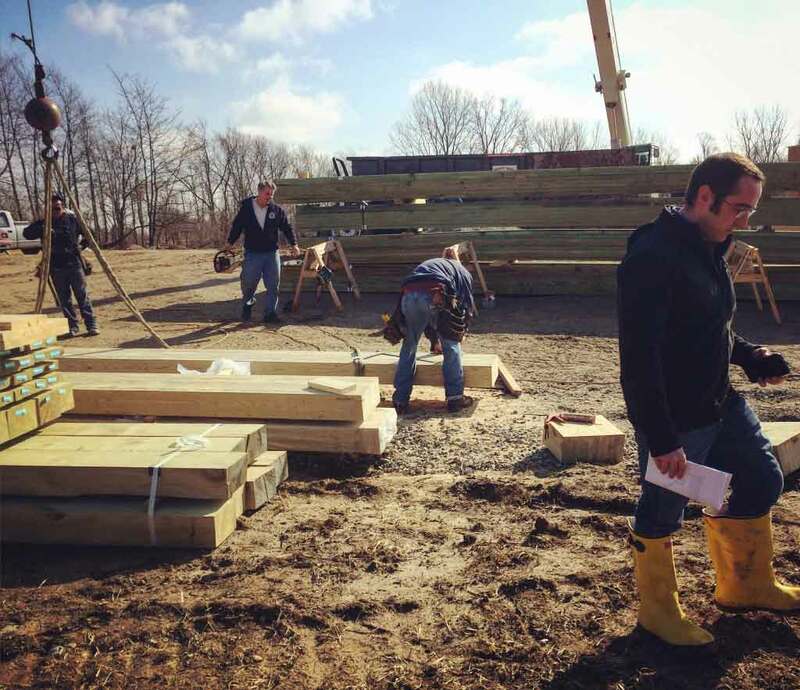 Framers are working their way around the house on the wood siding installations. 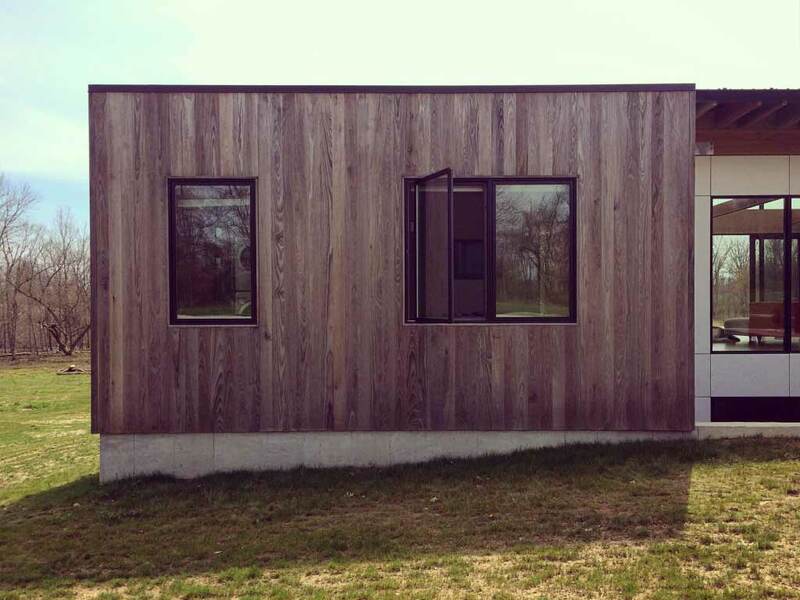 The thermally-modified Ash is really beautiful, so client is debating whether to finish the siding to maintain the nice warm tone. Ultimately they decided we will let it weather to grey. We ended-up coming up a bit short on the siding, and had to wait a few months to get enough right-sized Ash to finish the job. 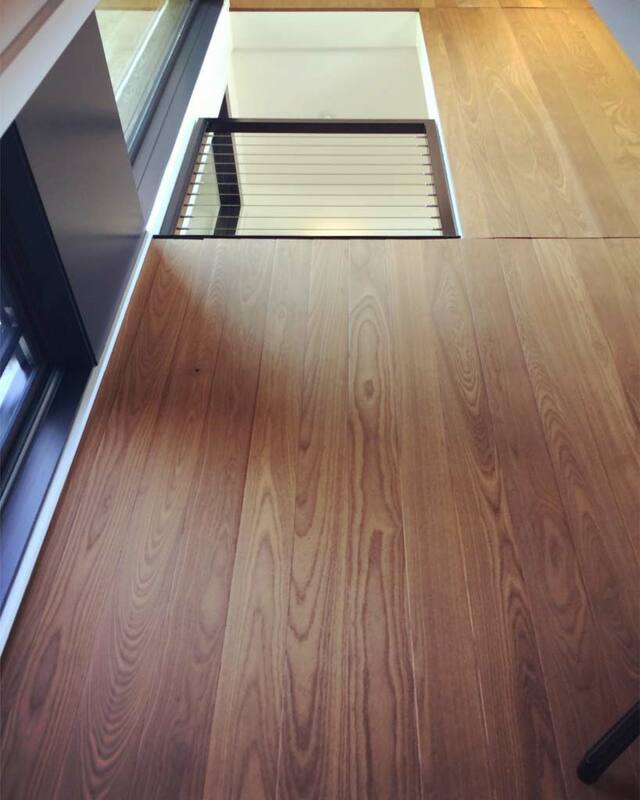 This caused some delays on metal copings and some other areas, but on the bright-side, we ended up getting some extra material that we were able to use in a few places on the interior. For the most part, the details are coming-out as planned. We have some work to do here and there, but overall we are pleased with how things are coming along. We were fortunate to acquire the black cement board siding from the supplier, as they had discontinued black. Luckily, they just happened to have a small quantity still available in-stock. 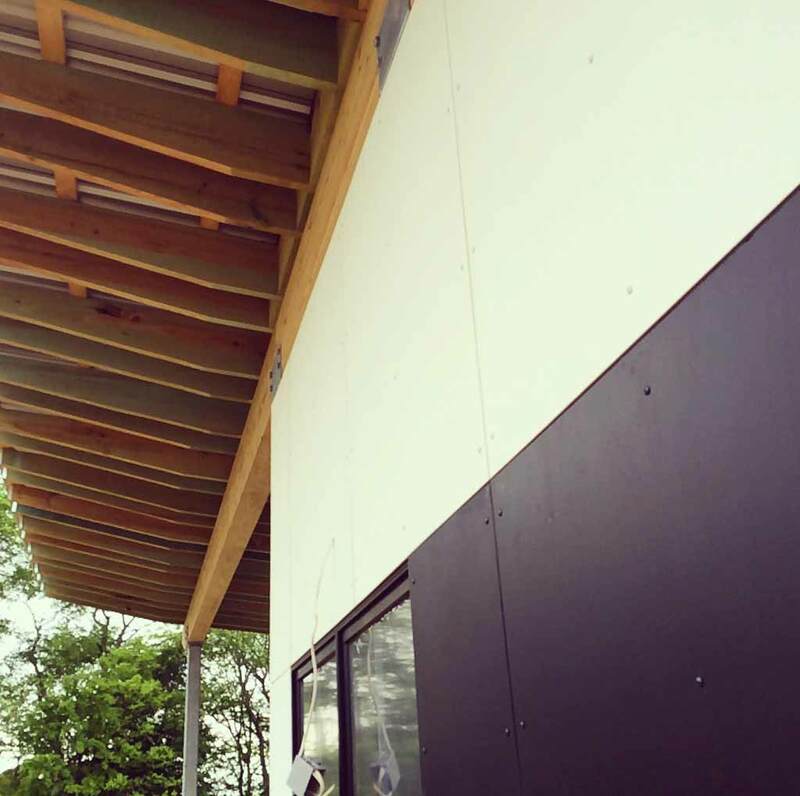 This prefinished cement board siding installation requires precision and patience. 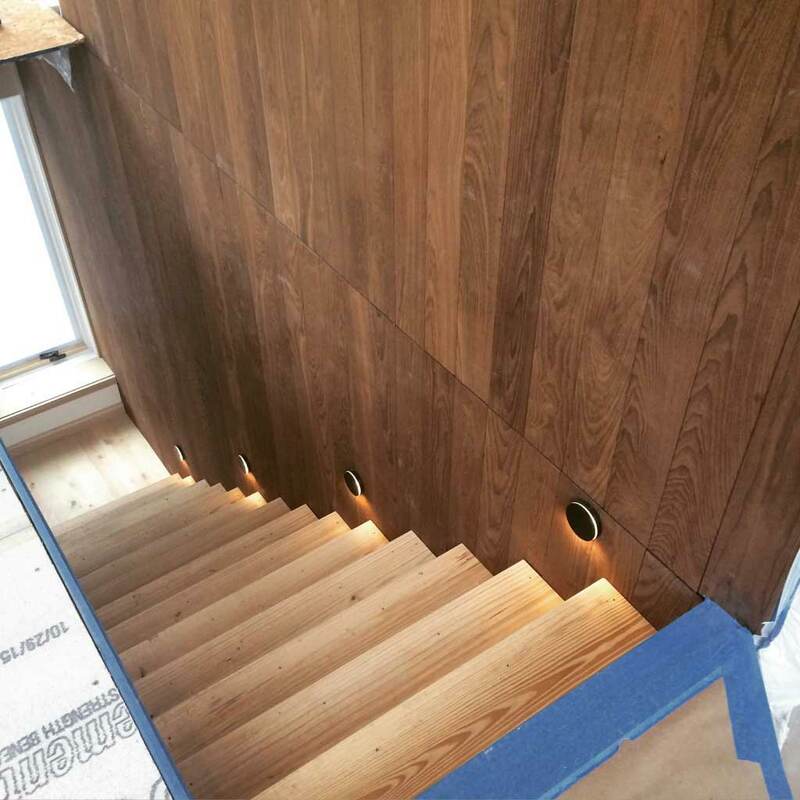 We need to light-sanded and seal all cut edges prior to installation, so it is not fast-going. For the exposed steel columns and brackets, we have decided to leave the galvanized finish exposed instead of painting them black. 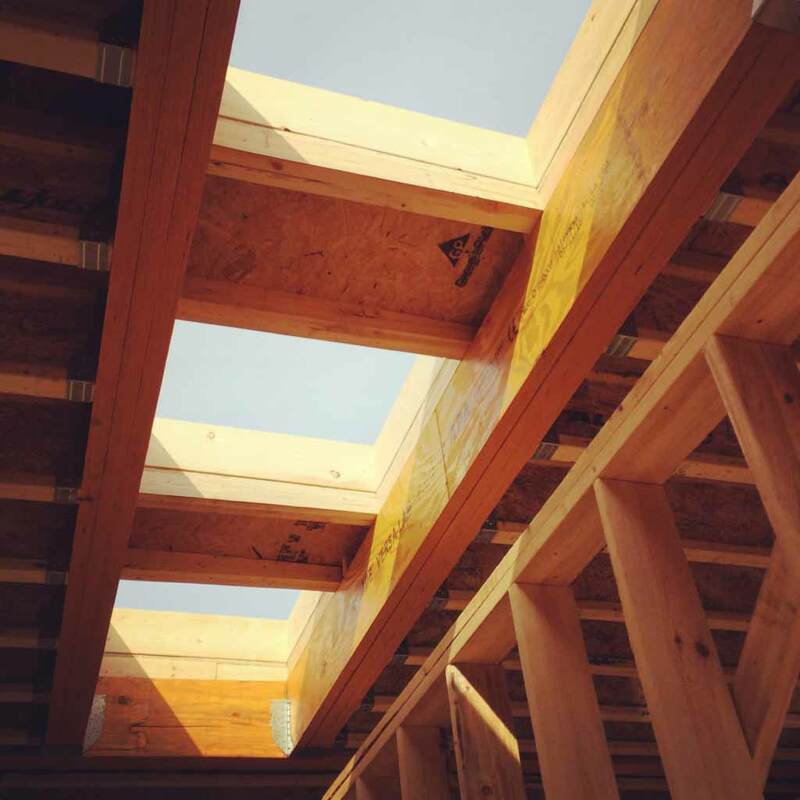 The roof-framing members are treated 2x12s and the supporting glulams are treated 7″ x 16″ that we mostly over-sized for scale/appearance. 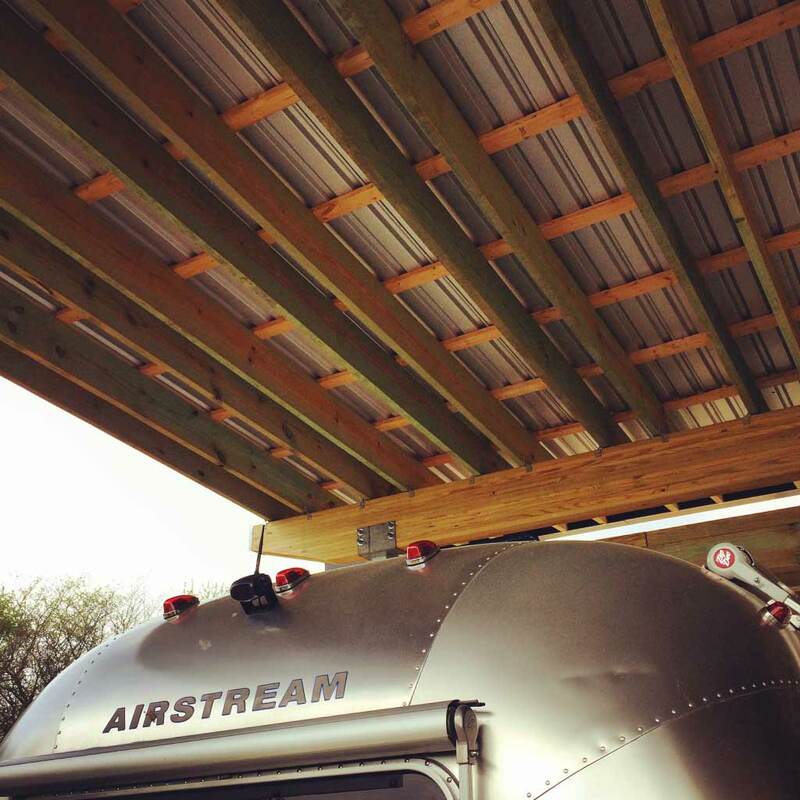 A major design driver for this project was our client’s passion for travel, and particularly, the integration of their Airstream, “Annie”, into the design. Regarding Annie, early in the design process we established that Annie be – 1) Protected, and 2) Functionally-integrated into the design. We achieved each and more. With Annie located on the west side of the property (just a few steps from the Kitchen and garage), the soaring wing roof structure protects Annie while providing abundant shelter from the hot west sun (for the house). Each client and each site bring a unique set of design opportunities to the table. 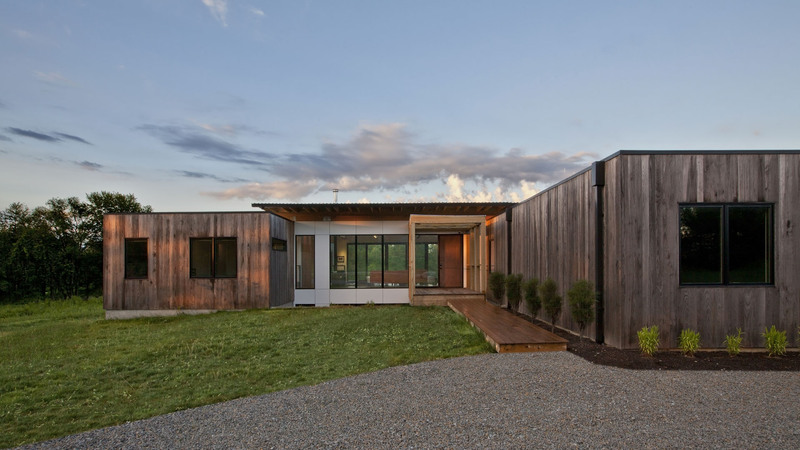 The raised buildable portion of this particular site had sloping grades and an abandoned gas pipeline running through the desired house location. 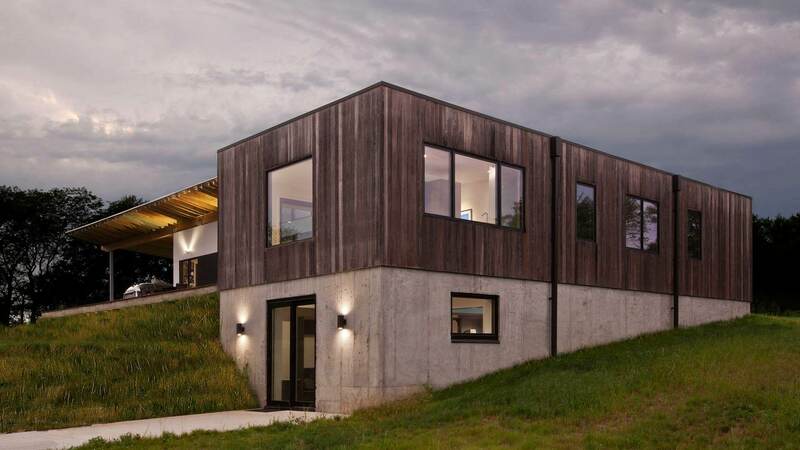 The initial and ultimate design concepts deferred to the pipeline, oriented house to receive the south light + best views, and gracefully addressed the sloping site. Garage wing to the right and bedroom wing to the left frame the north-facing entry. The angle from bedroom wing to garage wing mimics the adjacent pipeline. 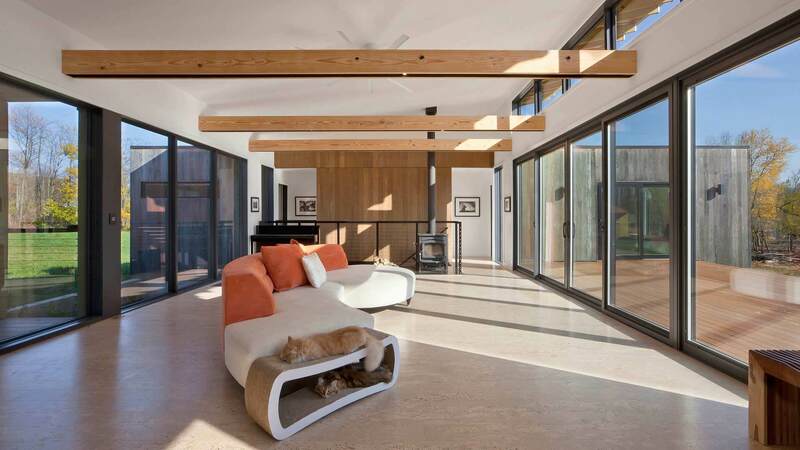 We wanted to bring natural light into the lower level, which we achieved with the north bay. And then the architectural bridge spans the bay to access the front door. 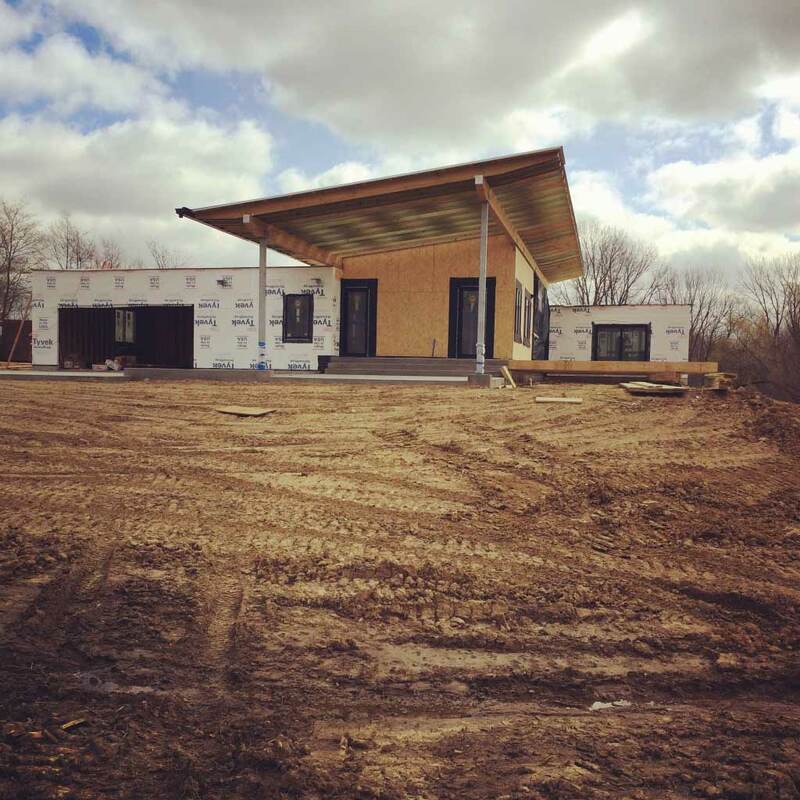 We are excited about the finishing details of the canopies not yet complete, which includes heavy timber posts and beams with treated glulam beams spanning the basement clerestory. To achieve the structural requirements for diagonal bracing, we have incorporated galvanized bracing of rods with clevis and turnbuckles, while bridge guardrails utilize stainless-steel cable-rail infill. 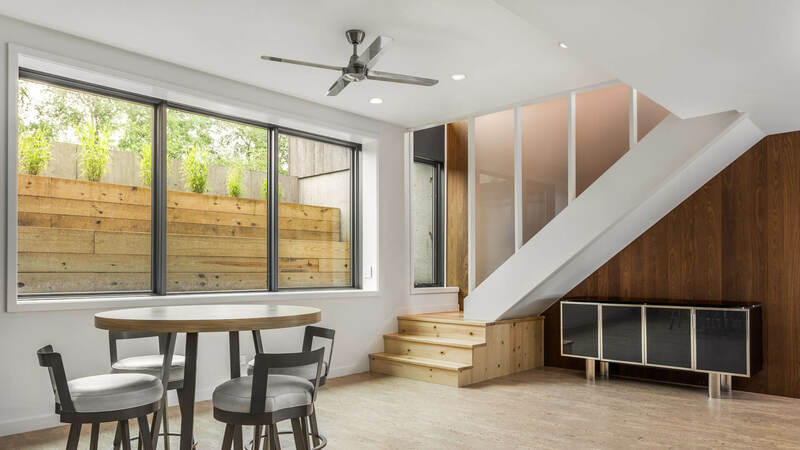 The basement clearstory area steps down to lower level with a couple of 30″ tall landscaped platforms to eliminate the need for guardrails. 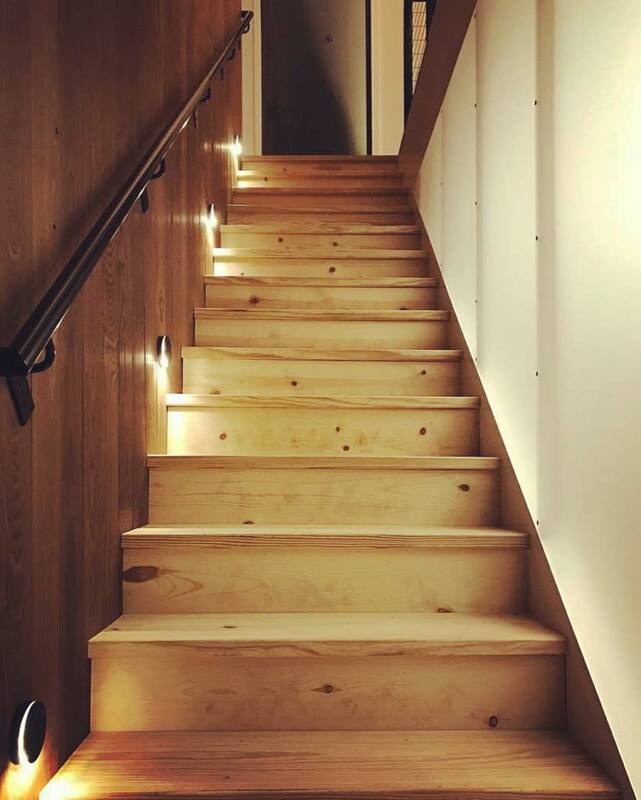 The light achieved helps make the lower level a desirable living space – stay tuned for photos/progress of the lower level, architectural stair, and canopy details. We are really happy with how the project is coming along and it is great to see things coming together mostly as planned. It’s important that we protect the design vision in built-form. Then, from there, we fit the expected quality within the agreed budget. 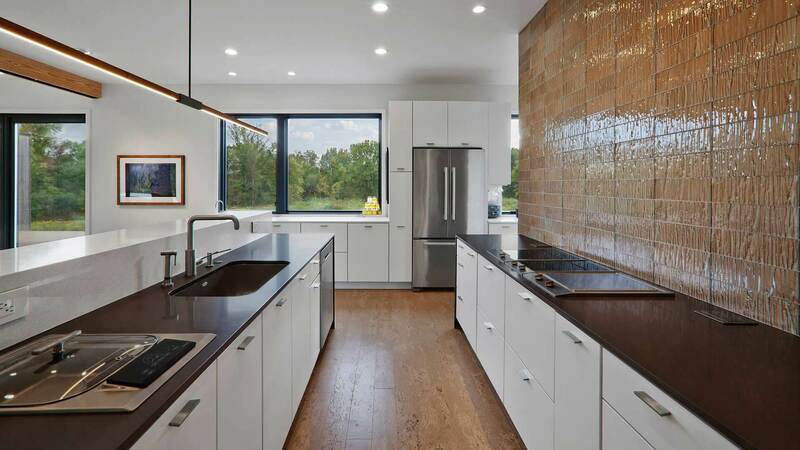 The trades for the project have never worked on anything like this from an overall design standpoint, so it has been a key asset having HAUS, the Architect managing the construction via WERK | Building Modern, in collaboration with our client. It is a unique, but mostly simple concept and design. 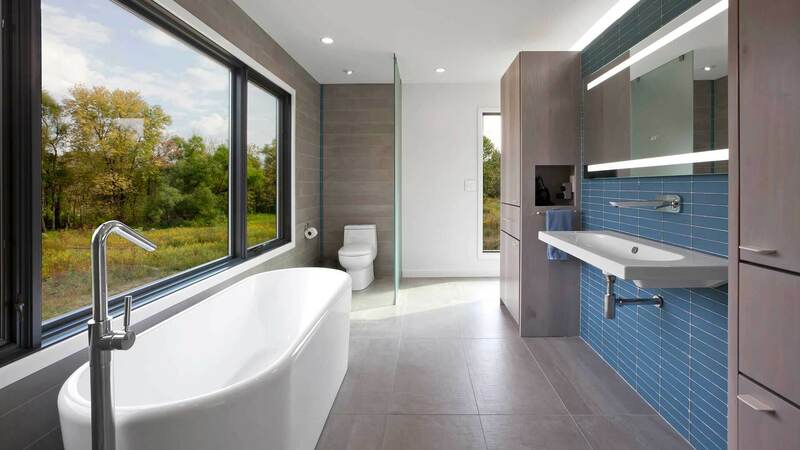 However, we have learned over the years that simple, minimal details are usually less forgiving and more challenging to achieve than more traditional details and assemblies – things line up, the trims are minimal, having less ability to hide imperfections. 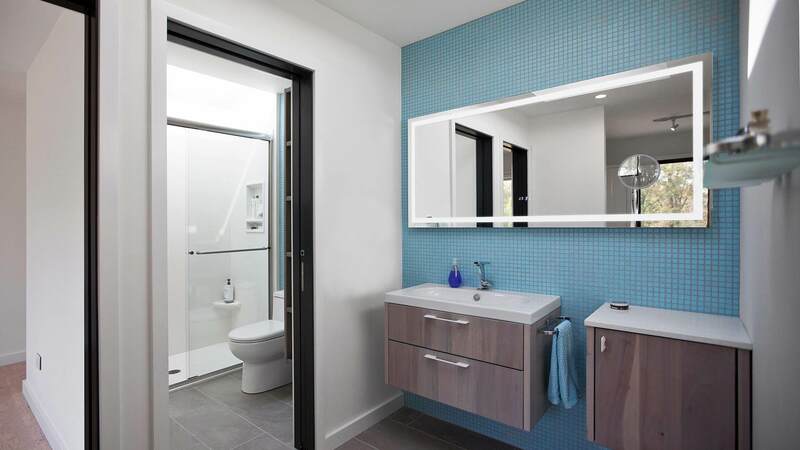 For the white siding material, we specified and installed prefinished cement board panels with matching exposed fasteners and 3/8″ gaps at panel joints. In all but a few special conditions now, we detail all of our wall assemblies as rainscreens. 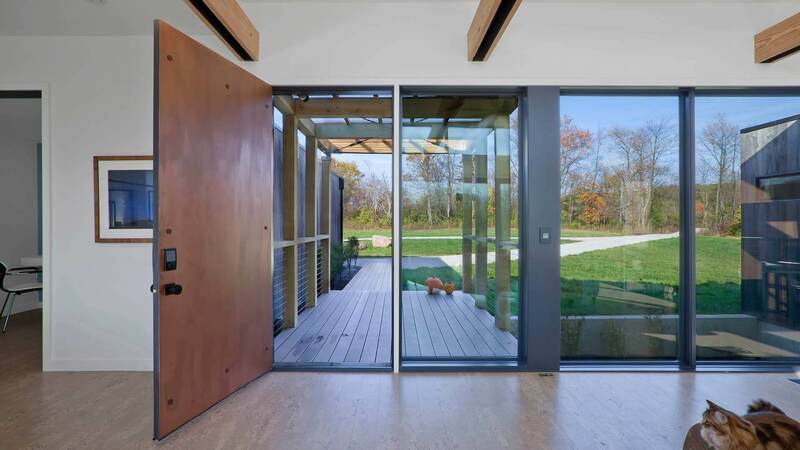 Even the thermally-modified wood is a rainscreen system. 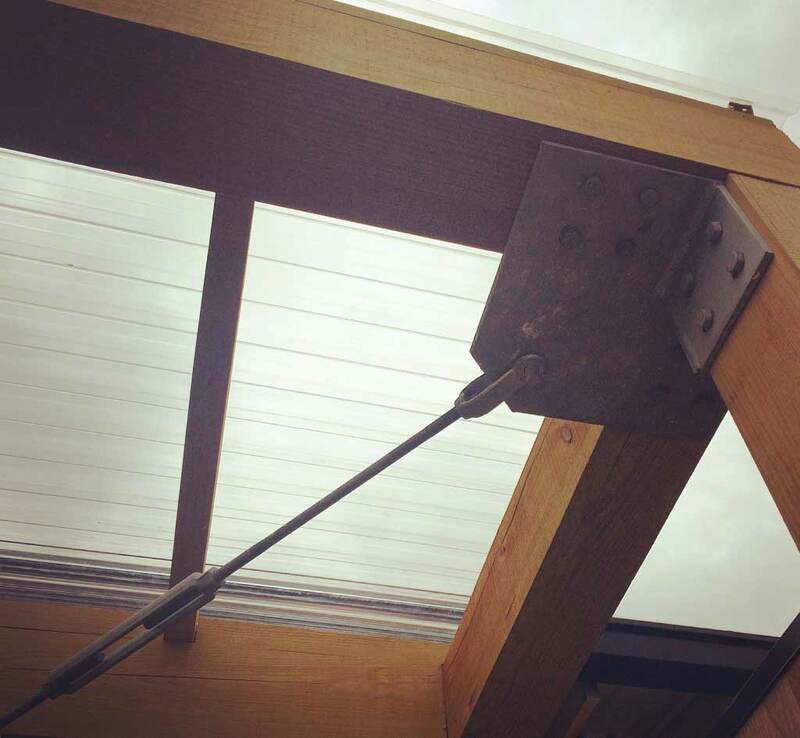 The open panel joints allow water to enter and drain out via the weather-resistive barrier and flashings. 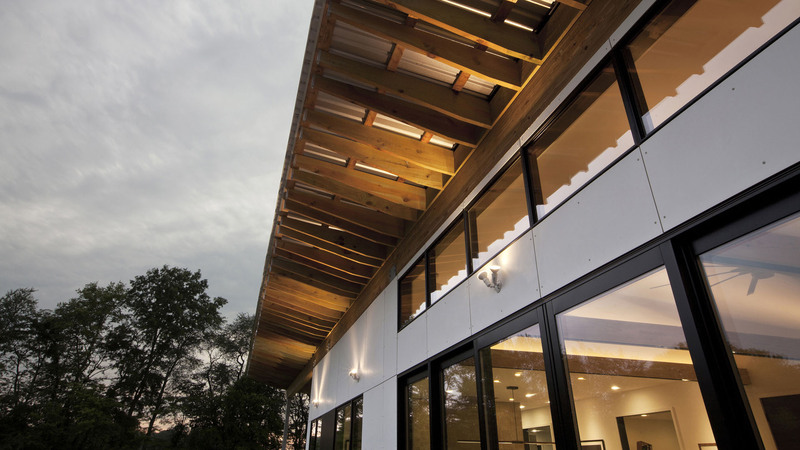 We sleep better at night knowing we have detailed and built our wall systems with the best techniques (RESILIENT DESIGN), especially when a project has minimal or no roof overhangs to shelter the facade. We are going on about month-10 now in the process. Trim carpentry and painting is progressing along with electrical fixture installations, cabinets, and tile. Kevin/Rachelle Swan (clients), Chris Adams (trim carpenter, painter, floor installer, quality control expert), and Derek Mills/Chris Short (Architects-Construction Managers) have been teaming together and with the numerous trades to “bring it home”. 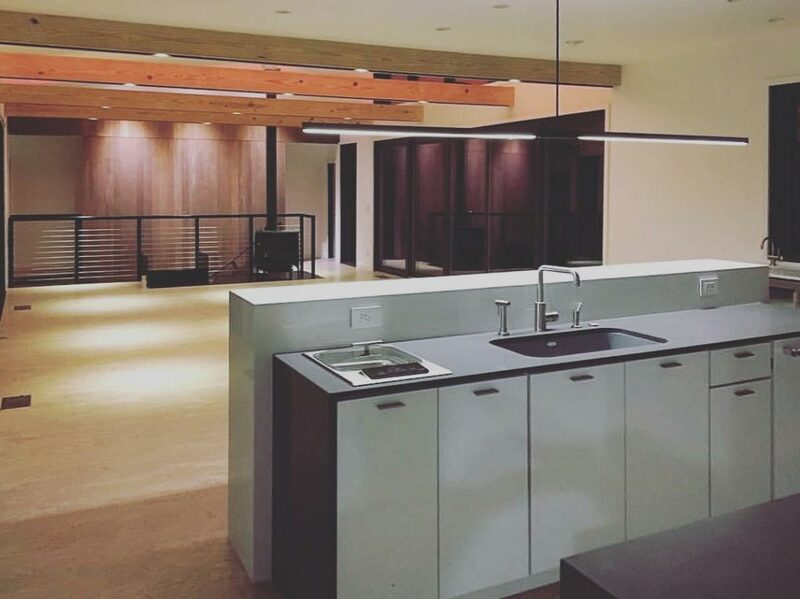 Exposed clear-coated double 2×10 Southern Pine beams conceal track lighting. We have painted track reveal dark grey to camouflage the dark track fixtures. Beams also uplight the vaulted ceiling. 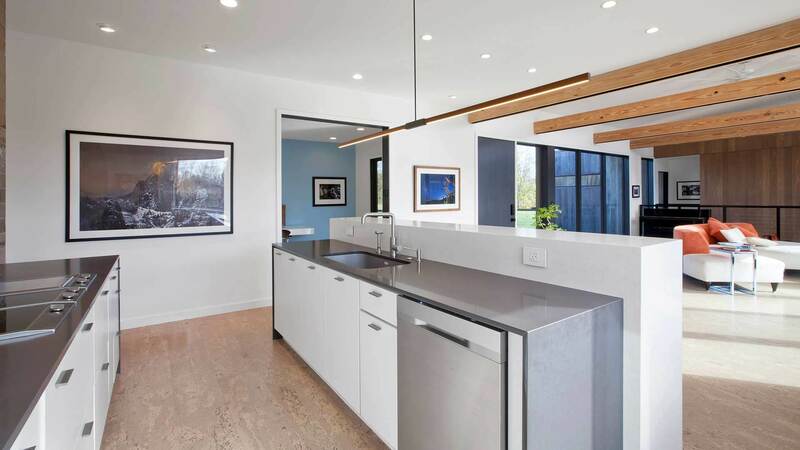 All lighting, security + HVAC is controlled via owner’s smart devices (Smart Home Technology). During the construction stage, we considered a few alternatives to the original south-stepped landscape wall. Ultimately, we decided to abandon the stepped-wall in favor of a new concept – a new elevated soccer plateau – achieved with many, many loads of excavation spoils from other project locations. Coordinating the desired elevations and precise angle at plinth edges has been an effort, but will be well worth it in the end. 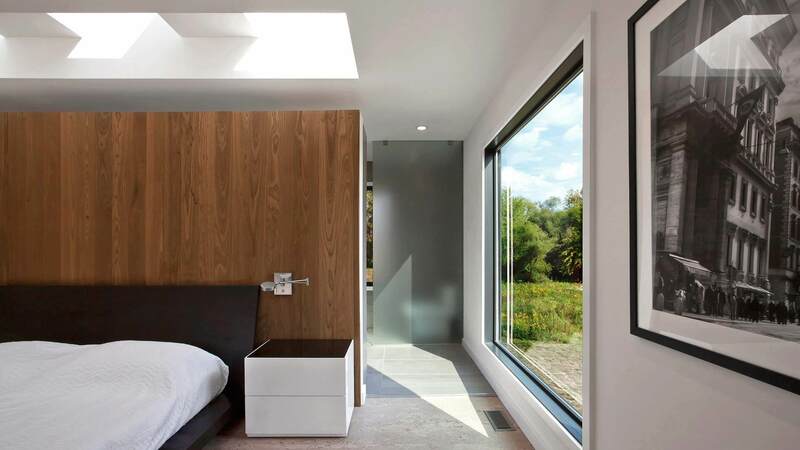 We think it will be a dramatic functional and aesthetic base – an extension of the modern architecture – a mediator from house to otherwise virgin landscape. 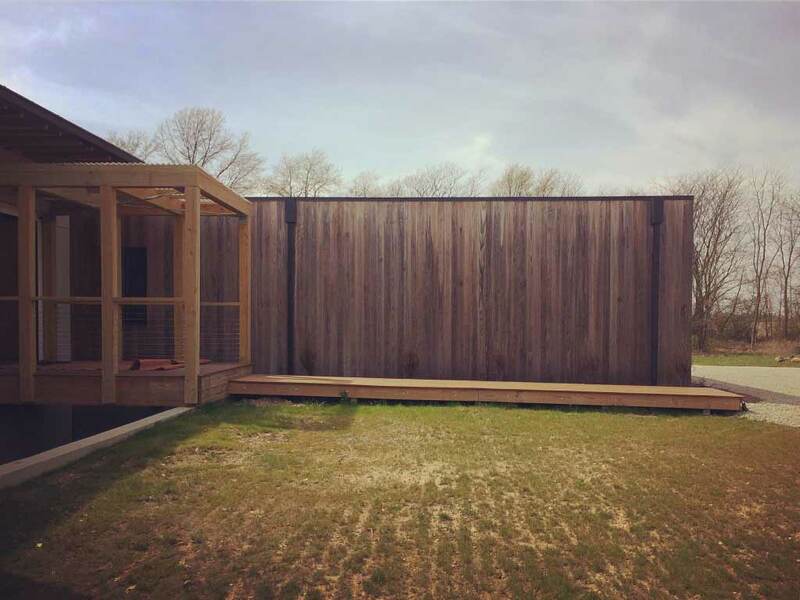 We envision the plinth as manicured lawn, and surrounding grades with wildflowers and wild-grasses for a natural, low-maintenance landscape. 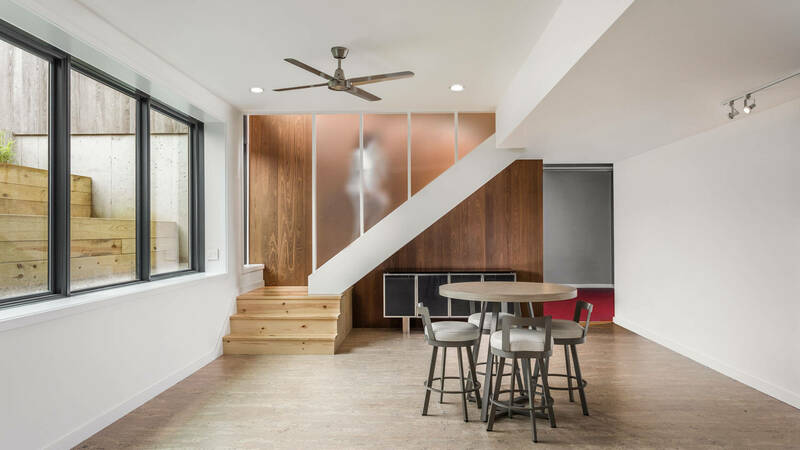 Conceptually, the thermally-modified wood-clad east bedroom wing slides though the side of the living space, so we continued the wood from exterior through the interior living space to stay true to the concept. 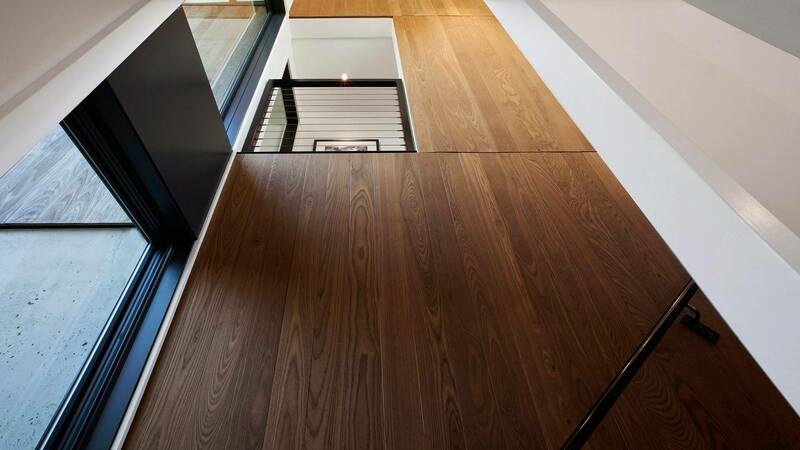 The wood on the exterior will weather to grey – the wood inside should maintain this darkened effect of the Ash wood. The burned-wood smell is evident on the finished product, but only in very close proximity. 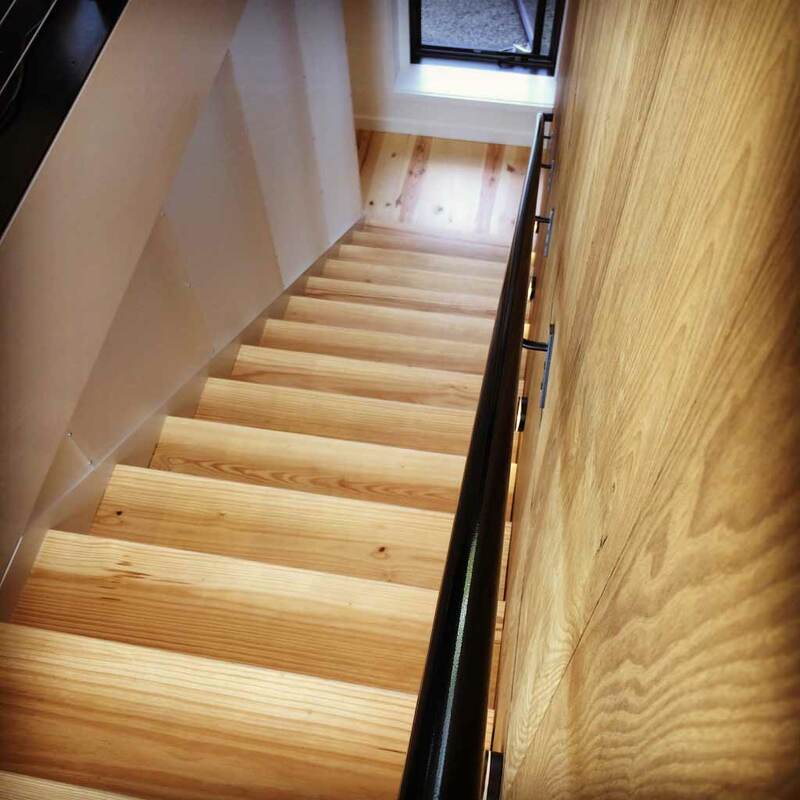 We chose to finish the stair in clear Southern Pine. We considered using the Ash from walls, but it is more brittle and we were afraid it may crack on installation and over time. 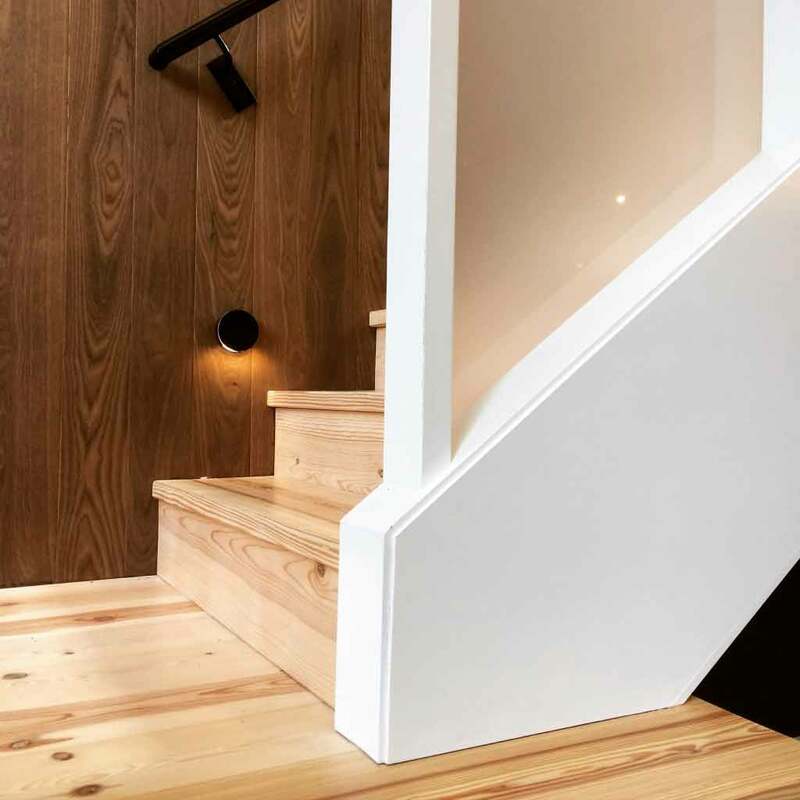 The pine works for the stair, as it is a nice compliment to the exposed Southern Pine beams in the adjacent living space. 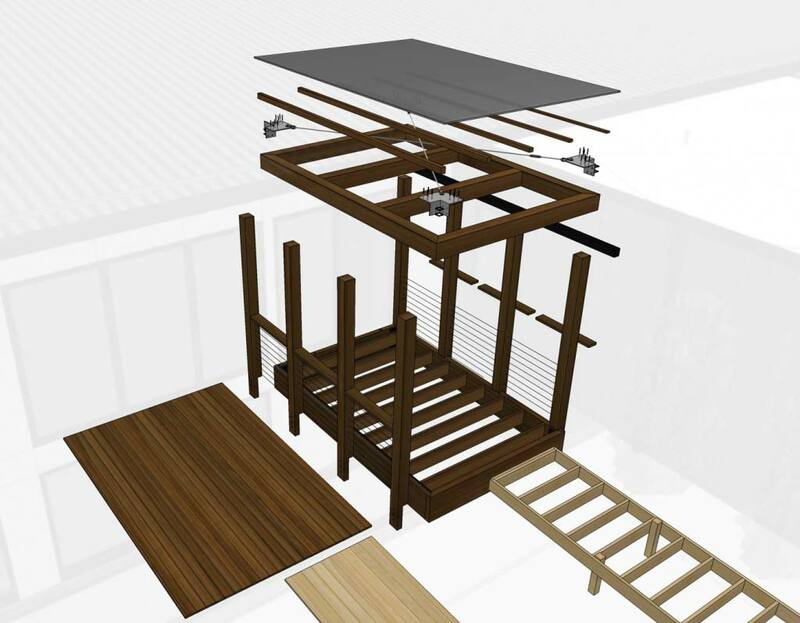 We are looking forward to seeing the steel rail system and wood-burning stove installations next. 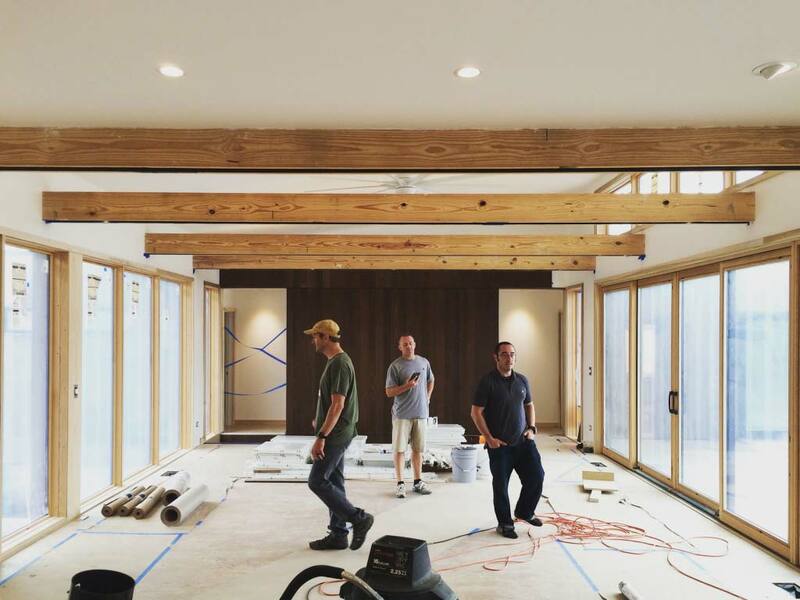 Client has been instrumental and a great partner in coordinating interior trim carpentry details, lighting fixture selections, and interior finish selections in collaboration with HAUS and the Construction Manager, WERK | Building Modern. 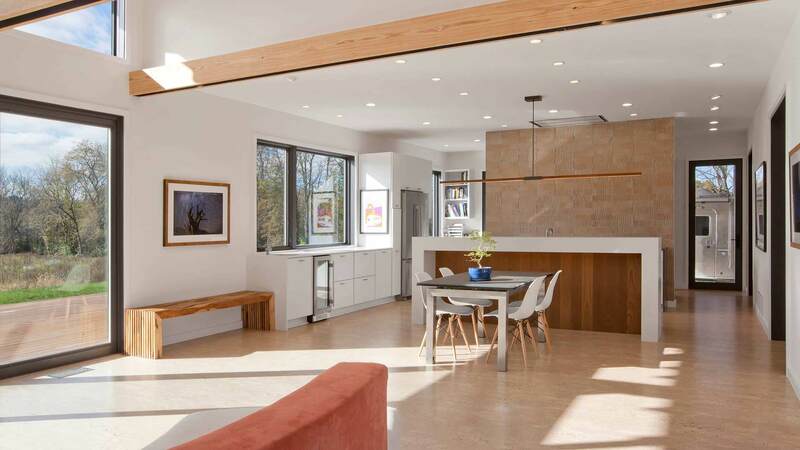 In the early fall of living in the house, Owner has confirmed that Passive Solar Building Design is no joke – the home is maintaining 70 degrees inside during the daytime (35-45 degrees outside) on sunny days without furnace.